With Spring finally here we are looking forward to getting our planed outdoor projects started. This year we are going to erect a "Telltale" frame so that we can hang our "Telltale." We also plan to finish the lavatory and install a semaphore. We will fund these projects by hosting a spaghetti dinner April 5th, two flea market\used book sales May17th--Sept 13th, a classic car cruise night July 28th and a hayride/pumpkin sale during Williamsville village's Octoberfest. On Mar 30th Brian Angevine and his daughter Megan Helped me clean and organize the depot. We cleaned and emptied the two display cases. Brian then filled the cases with his personal Lehigh Valley artifacts. 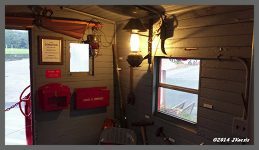 The display cases and the depot look great. These items will be on loan to the depot naex month or so. Thank you Brian and Megan. 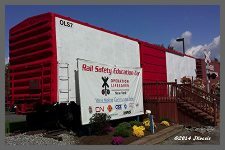 A great Thank You goes out to Leslie K. for taking over the management of the Erie County Fair Caboose! As I wrote in the last issue of the FLYER, I am not entirely getting out of the way. 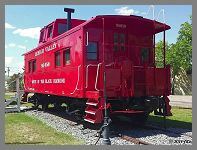 What I needed was for someone to order passes for the fairgrounds and coordinate volunteers to staff the caboose and the boxcar. The Fair runs August 6-17 and we are open 11am to 7pm. I will help Leslie and of course, work a couple of shifts. 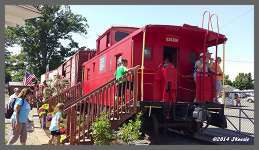 For the 11-day run of the Fair, we had 11,583 visitors to the Caboose and Boxcar display. A fairly decent number on average with the past couple of years, but far below the number of visitors we used to get before the cars were relocated to the Gate 1A area behind the new horse barns and Showplex arena. 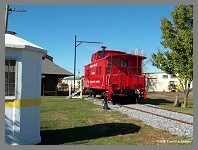 You are probably aware that the EC Fairgrounds has requested that we remove the three cars as they have plans for expansion in the area. 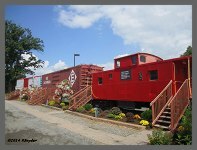 Since 1984, our N&W Caboose has been a part of the Fair Experience. 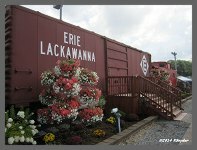 In 1996 we added the Erie Lackawanna boxcar and in 2004 the Fair Grounds added the Operation Lifesaver Car and a 0-4-0 Tank Locomotive. 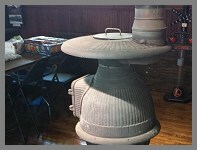 The Tank Engine was on loan from the Arcade and Attica Railroad and was returned in 2009. We have a Sept 30th deadline to move the cars. 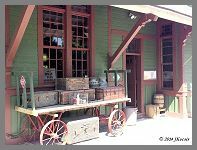 If we are unable to move them, the EC Fair will dispose or give them away and these cars are all very historic pieces that we desperately want to preserve and display at the Heritage Discovery Center. We have a contractor lined up to move the cars, but it will cost approximately $5,000 per car to move them to the HDC. 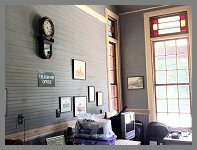 CSX has generously donated $6,000 towards the move, but we still need to raise $9,000 in fairly short order to meet the deadline. If you can help out, please consider making a donation in any amount to help us preserve these three cars. 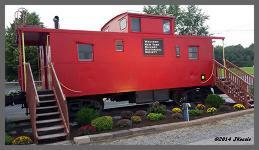 Just click the link below to go to our Heritage Discovery Center web page and click the Paypal Donation Donation Button to make an online donation, or send your contribution to WNYRHS 407 Rowley Rd Depew, NY 14043. Please share this urgent appeal with your friends. last Erie County Fair Train. The fair was celebrating its 175th Anniversary. 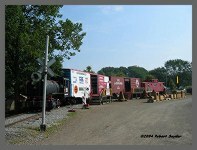 Its been another busy summer at the Williamsville Lehigh Valley Depot. Much attention was given to completing long term projects. 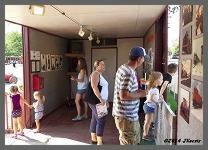 The Depot hosted two Flea Markets, Theater Productions, a Car Show and many open houses. 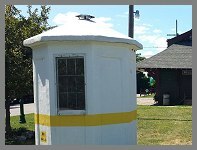 Below are some of the summer improvements that can be seen at the Depot. 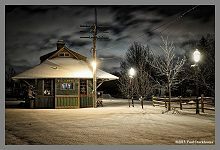 A soft late December snow had just fallen when Paul Stackhouse captured this wonderful night shot of the depot. 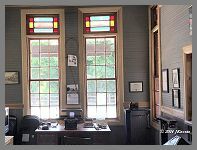 It was another busy summer and fall during which the semaphore was raised in front of the agent�s office and the �tell-tales� hung over the tracks near the caboose. Larry Brenton provided guidance and considerable work with help from others of the Depot Crew. 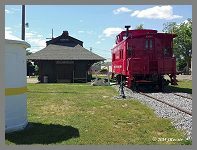 Planning for further restoration and improvements in 2015 and the fund raising necessary to bring these projects to completion, will occur at the January meeting of the Williamsville Depot steering committee. 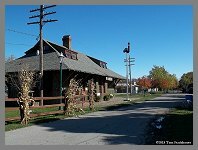 Projects on tap for 2015 include the first phase of restoring the loading dock on the east end (freight side) of the depot. 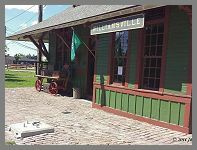 The Williamsville Depot Committee is looking for people interested in the following: Construction & Maintenance, event planning, tour guides, marketing, data base management and finance/budget knowledge. We would welcome any and all help you may have to offer. 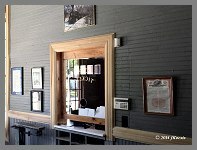 Call the Depot at 716-633-7002 or eMail Art T. Thank You!